Earn up to 480 reward points. Get two axes in perfect tune with these compact red stunners. The KORG PitchCrow-G is the most compact of all the company's fully featured clip-on tuners. Its streamlined design includes everything you need to tune accurately, quickly and is approximately 20% smaller and lighter than previous KORG models. 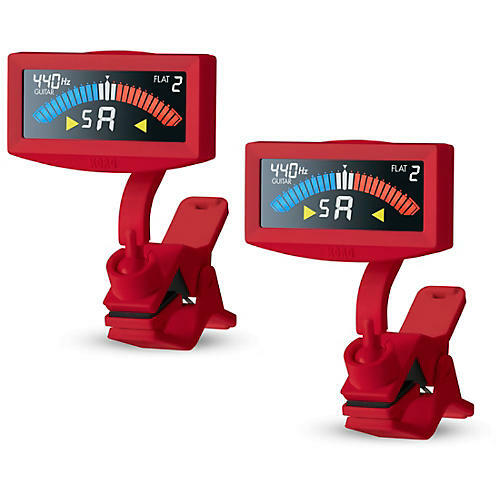 Included with the PitchCrow-G is a vivid full-color LCD and dedicated guitar/bass modes, as well as a new ultra-high precision fine tuning function that allows for accuracy as great at ±0.1 cents. Battery life is also approximately three times longer than previous units, allowing for approximately 24 hours of continuous operation. Forty years after it developed the world's first needle-type meter tuner, KORG is proud to set the new standard for accuracy and reliability in clip-on tuners: the PitchCrow-G.